Photo by Frank Guido, Creative Commons Licensing. A recent earthquake in California’s Napa Valley is renewing calls for an earthquake early warning (EEW) system. Such a system could significantly benefit Alaska. The magnitude-6.0 quake caused an estimated $1 billion damage to wineries and other businesses, as well as injuries and the loss of several mobile homes to fire. An early warning pilot system called Shake Alert is already near the testing stage in California. That system is the product of cooperation between the United States Geological Survey, the University of California Berkeley, and the California Institute of Technology, among others. The University of Washington is working on a Pacific Northwest system in conjunction with that of California. Remnants of the ’64 quake in Earthquake Park. Basic EEW systems work by detecting P-waves. Also known as compressional waves, P-waves are the fastest seismic waves in part because they radiate out in the same direction as the seismic energy. Detecting these waves allows the system to send out an alert prior to the arrival of the more destructive S-waves. These waves produce a rolling motion, though they are not the surface waves one associates with roadways rolling like the ocean. Surface waves travel slower than both P- and S-waves. The goal of the institutions working on Shake Alert is to create a network of sensors. By collecting data from a variety of locations, it becomes possible to accurately analyze larger earthquakes. The minimum spacing between sensors for timely reporting of earthquakes is 12 miles. This would obviously make an EEW system in Alaska more costly due to the state’s massive geography. However, the state’s size does give Alaska an advantage that many locations in the Lower 48 do not have. The further away from the epicenter of an earthquake, the more time a populace has to prepare for the arrival of S-waves and surface waves. Some of the practical actions for which this time allows are moving to a safe location, closure of water and gas valves, and clearing of bridges and airport runways. Like Napa Valley, Southcentral Alaska lies in an area of the highest seismic hazard. But unlike California, where major faults run right through metropolitan areas, the most threatening faults in Alaska tend to be some distance from population centers. This means Alaskans could have more time to prepare for the arrival of earthquakes. In a state that depends on natural gas for much of its heating, that extra time to close gas valves could save a lot of lives and property. Keeping a few extra cars off of the planned Knik Arm Crossing could also minimize a disaster. At a magnitude of 9.2, the 1964 earthquake was the second largest ever recorded, behind the 1960 Chile earthquake (9.5 on the Richter scale). Its epicenter was about 56 miles from Valdez and 75 miles from Anchorage. An EEW like the one envisioned in Shake Alert would have provided Valdez about 15 seconds warning before the shaking started and Anchorage about 25 seconds. A lot can happen in 15 seconds. 15 seconds would be enough to flee inland before your neighborhood tumbles into Knik Arm, for example. This time would be in advance of the warning provided by the extensive Pacific Basin tsunami alert system, of which Alaska is already a participant. According to the Alaska Earthquake Information Center (AEIC), “Alaska has the greatest earthquake and tsunami potential in the entire United States.” The state experiences between 50 and 100 earthquakes every day. 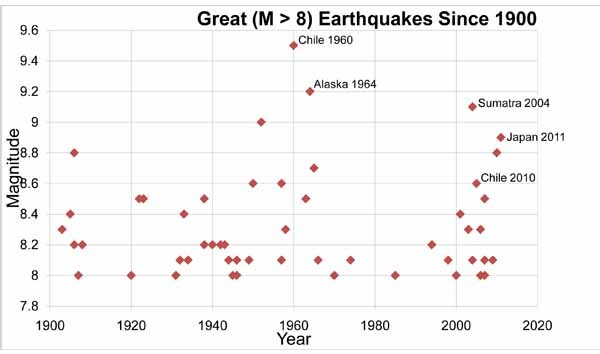 On average, Alaska sees a “great” earthquake, one that has or exceeds a magnitude of 8.0, every 13 years. At an Anchorage Science Pub presentation in March, Cindi Preller, who works at AEIC and is Tsunami Program Manager for the National Oceanic and Atmospheric Administration’s (NOAA) Alaska region, cautioned that the globe can expect a massive seismic event very soon. Although she admitted the data was limited, there appeared to be a trend developing for great earthquakes. Worldwide, great earthquakes have seemed to come in swarms since 1900. If that trend holds, Preller said we have yet to experience the current swarm’s “big one.” The largest quake since 1964 occurred in 2004 in Indonesia. That earthquake, with its attendant tsunami that drew so much cultural attention, was only one-fourth the size of the Chilean earthquake of 1960. The benefits of an Alaska EEW seem obvious, and the idea of a national early warning network seems to be gaining traction. There have been multiple U.S. House subcommittee hearings on EEWs this year. In March, Professor John Vidale of the University of Washington testified that a single earthquake of 9.0 would cost between $50 billion and $100 billion. By contrast, at a hearing in June, Rep. Alan Lowenthal (D-California) estimated that an EEW would cost $38 million in its first year of operation and $16 million every subsequent year. Shake Alert similarly expects that a fully operational EEW in California would cost about $80 million over five years, while a system in the Pacific Northwest would cost about $65 million over five years. As mentioned above, Alaska’s size would mean more sensors and higher costs. Meanwhile, population density and infrastructure in Alaska is significantly less than California and the Pacific Northwest. However, with Alaska hosting a large percentage of the nation’s natural gas and oil drilling equipment, a few extra seconds to close some valves could very well stave off a disaster. EEW systems are not new. According to Shake Alert, these systems already exist in China, Italy, Taiwan, and Japan, as well as the cities of Istanbul, Turkey, Bucharest, Romania, and Mexico City. Japan’s system, it notes, have generated jobs in the private sector. Shake Alert sees the potential for private companies in the U.S. to develop technology that would respond to earthquake alerts, safeguarding the energy grid or even moving elevators to the nearest floor and holding open their doors.